John Dickinson (1732-1808) was a colonial American lawyer, politician and essayist. Dickinson served as a delegate to most of the revolution’s notable bodies, though his greatest contributions to the revolution were probably as a writer. Born in Maryland, John Dickinson was the descendant of British Quaker immigrants. He was raised in Delaware and educated by his family and community, before relocating to London for study while in his early 20s. He returned after three years, gained entry to the bar and set up a successful legal practice in Philadelphia. Dickinson married Mary Norris, the daughter of a wealthy and influential Pennsylvanian family, and later gained a seat in the Pennsylvania legislature. When the revolution began to unfold in the mid-1760s, Dickinson became an ardent critic of British policy. 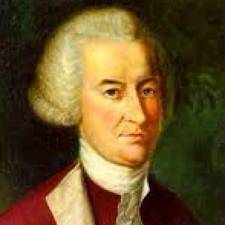 He attended the Stamp Act Congress (October 1765) in an unofficial capacity, proposing resolutions that were adopted with little change. In 1767 Dickinson began writing and publishing a series of 12 articles entitled Letters from a Farmer in Pennsylvania, in which he suggested that Britain’s attempt to lay taxes and trade duties on the American colonies was unconstitutional. Dickinson’s Letters from a Farmer became some of the most widely read revolutionary tracts of the 1760s. They earned him a degree of fame and a reputation both for constitutional expertise and political radicalism. He was selected as a delegate to both Continental Congresses, where with Jefferson he co-wrote the second Congress’ Declaration of the Causes and Necessities for Taking up Arms. While Dickinson was strongly critical of British policy, his objective was not war or revolution. He was a pragmatist who recognised the weaknesses of colonial America – its military weakness, its disunity and its lack of foreign friends – so he urged reconciliation with Britain rather than independence. In 1775 Dickinson penned the ‘Olive Branch’ petition, a last-ditch attempt to restore peace between Britain and the colonies. Dickinson abstained from voting on the Declaration of Independence in 1776, choosing instead to command a militia unit. He later returned to state politics in Delaware and Pennsylvania. During the ratification period, Dickinson supported the Constitution, believing it would be beneficial for smaller states like Delaware.